Staying warm and dry is the key to comfort on the ski hill. The Spyder Youth Propulsion Ski Pant offers weather-tough protection with cool, modern style. Its stretch liner and shell move with your body and use HydroWEB™2.0 technology to both keep moisture out and wick sweat, so you stay dry inside and out. They adjust along the waistband and come with removable suspenders to keep the pants up. One of the coolest features is Small-to-Tall, which extends the cuffs an additional 2 inches when you release a stitch. The Propulsion pant is a great choice for younger skiers after warmth, reliable weather protection and a stylish, modern look. Stretch-woven shell with stretch liner and 10K HydroWEB™2.0 Laminate keeps you dry, inside and out. Thinsulate™ (60g) insulation provides lightweight, low-profile warmth. Removable suspenders adjust to fit. "The color says FRONTIER is that black? Or how would you describe it?" "The color Frontier is a very dark navy blue. We hope this information helps !" "is electric blue the same as french blue?" 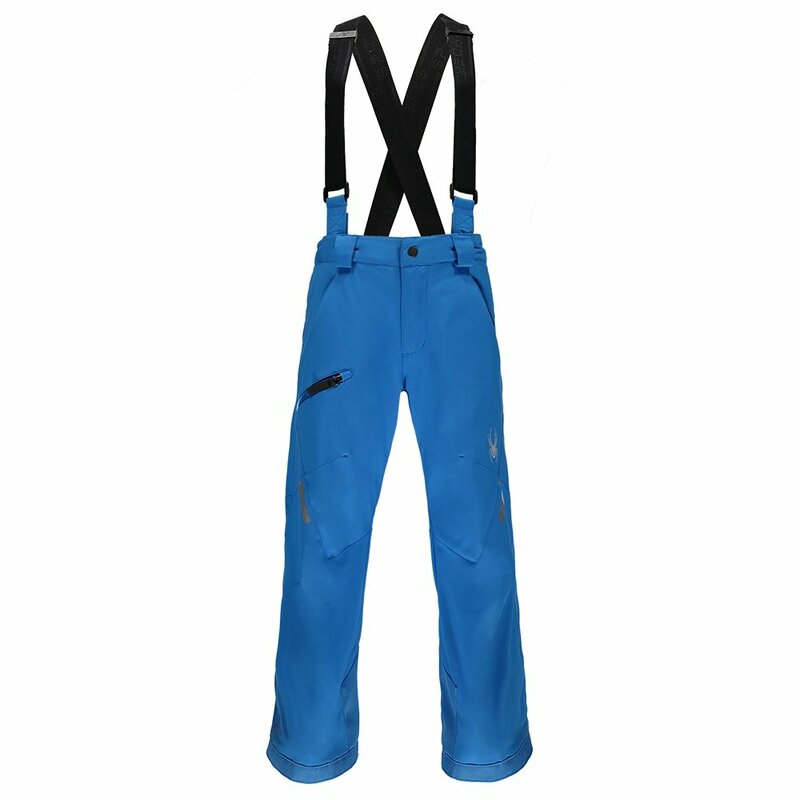 "The Electric Blue is MUCH brighter than the French Blue that is available in the Spyder Propulsion Ski Pant for boys. Hope this information helps!" "Is burst red the same as rage red ?" "The color Burst on the Spyder Propulsion Ski Pant is more on the orange side that the Rage Red. Hope this information helps!" "Is French Blue the same/close to Frontier Blue?" "The French Blue and Frontier Blue are very similar blues but not a perfect match. They are from different Spyder ski seasons. Hope this information helps!" "do these have zippers from top to bottom?" "No, the Spyder Propulsion Ski Pant does not have top to bottom side zippers. Hope this information helps!" These are great pants, waterproof and warm. As always, Spyder products never fail. Keeps you warm and quality is exceptional. Fit is true to size!